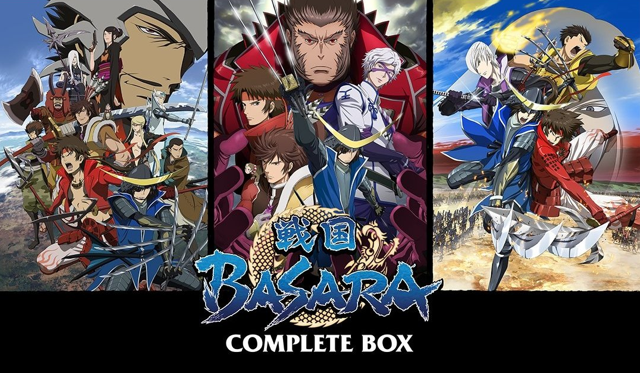 To celebrate the upcoming Sengoku Basara: Judge End anime series, Capcom announced that the original anime will receive a deluxe Blu-ray rerelease. The Sengoku Basara Complete Box will go on sale on 18th June 2014 priced at ¥36,500. The content is rather impressive. Sengoku Basara -The Last Party- bonus CD incorporating the seventh Variety Party CD and The Last Variety Party CD: Kaien! Shukuteki-tachi No Saigo No Variety Party! Except for the digest clip which plays at the start, the movie will feature a Japanese audio track in Linear PCM 5.1 surround. The rest of the BD discs will contain Linear PCM stereo audio in Japanese for the main footage and audio commentaries, as well as Dolby Digital stereo and regular stereo. It is unlikely that this set will include any English subtitles or the dub - just like the previous DVD/Blu-ray releases, the specification only lists Japanese audio without subtitles. In total there will be 17 discs in the set: 9 Blu-rays, 5 DVDs and 3 CDs. That equates to a runtime of around 1,368 minutes, or 22 hours and 48 minutes. The discs will be presented in two digipaks housed within an artbox. 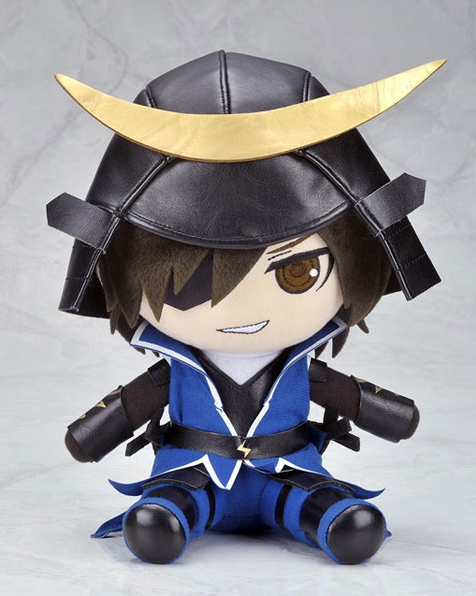 There will also be a few exclusive bonuses unique to the Sengoku Basara Complete Box release. A three-sided artbox illustrated by the anime's character designer Ookubo Tooru. A mini-autograph sheet with a comment and signature from seiyuu Nakai Kazuya (it's a replica, not an original signature). Note: The first season's Ashigaru Dance 4 Ver: Meibamen PV and the second season's Nippon Juudan SWORD SUMMIT videos will not be included. These were distributed on special limited edition DVDs which collectors could apply for once they'd purchased all of each season's single DVD releases. The set can be ordered from CD Japan, Ami Ami, Yesasia, Amazon Japan, HMV Japan and any other reliable stockist. I'm not sure whether I need to own yet another copy of the anime...but I'll wait for them to announce any store-exclusive bonuses before deciding. Capcom have teamed up with convenience stores 7-Eleven, Lawson and Family Mart in Japan to offer printable bromides on the multifunction copying machines situated in branches across Japan. There will be a wide variety of designs; one for each of the 40 warriors in Sengoku Basara 4 as well as two pieces of image artwork. The price is ¥200 for a large bromide or ¥300 for an extra-large one. Pridas and Potako (large size only) provide the service via the copying machines' on-demand download features. The e-ma cough drops which were teased back at January's Sengoku Basara 4: Basara Matsuri 2014 ~Shinshun No Utage~ event have finally arrived in shops in Japan! There are four different Sengoku Basara 4 packaging designs to collect for the ¥189 'Giga Berry' blueberry and blackcurrant flavoured sweets. 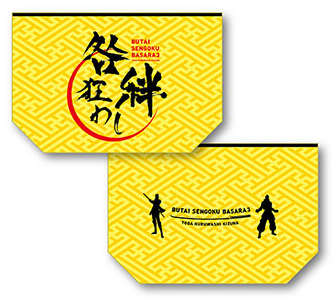 Japanese fans can also enter a prize draw to win special Sengoku Basara-related e-ma rewards. 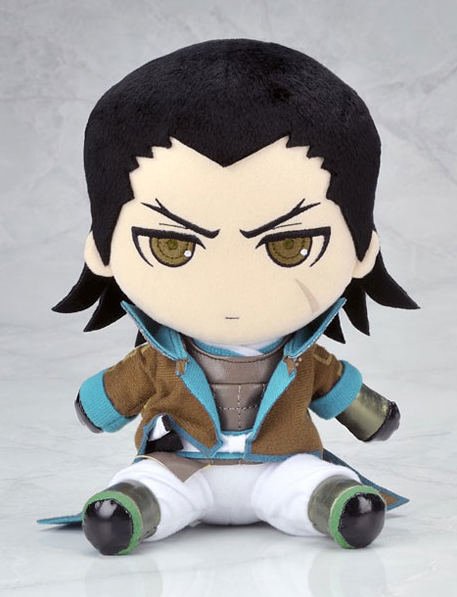 There will also be a pair of Sengoku Basara 4 plushies for Date Masamune and Katakura Kojuurou. They'll be released in May 2014 at the rather expensive price of ¥3,000 each. 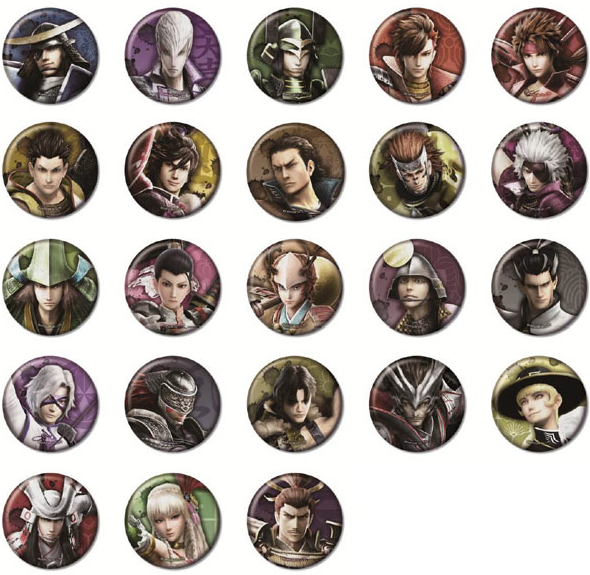 Next up is the Sengoku Basara 4 Bushou Can Badge Collection for release on 26th June 2014 at ¥7,200. There are 24 badges in total included in the set - one of the designs is secret. Four collectible bag charms will arrive on 26th June 2014 priced at ¥1,200 each. 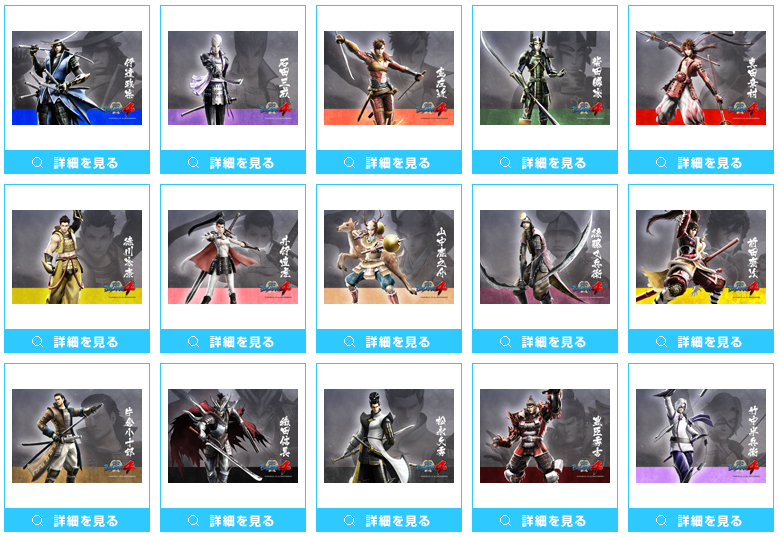 There are designs for Date Masamune, Ishida Mitsunari, Shibata Katsuie and Shima Sakon. 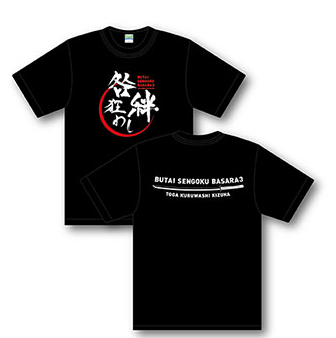 There's less than a fortnight left now before the Butai Sengoku Basara 3: Togakuruwashi Kizuna stage play begins its run in Tokyo and the official website has published early details of the special merchandise that will be on offer to fans at the venue. The merchandise without any sample images includes a choice of twenty five-piece sets of large photographs (¥1,000) and a choice of A4 mutsugiri photographs (¥1,000). 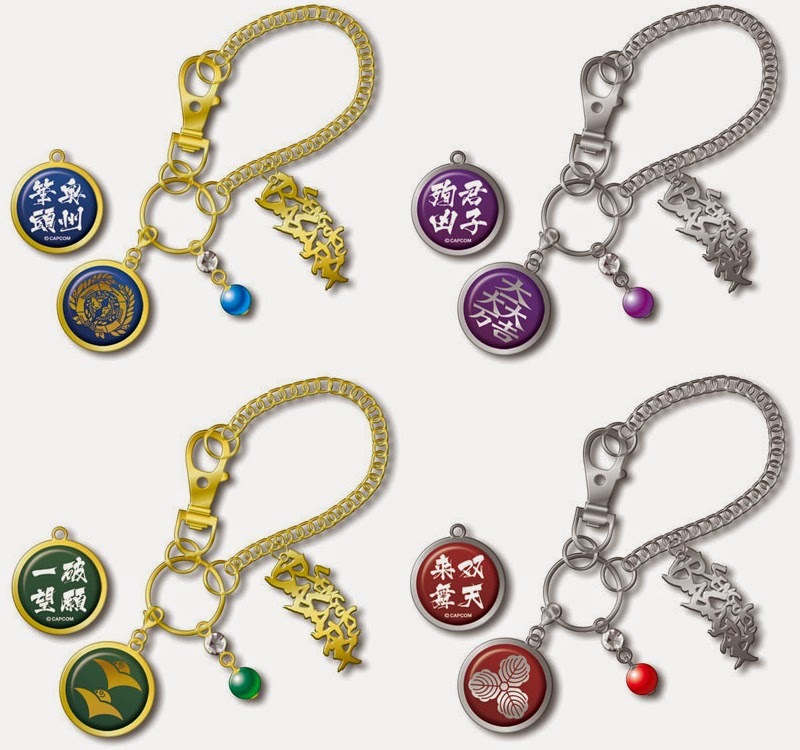 There are seven different designs to collect: Ieyasu/Yukimura (played by Matsumura Ryuunosuke), Mitsunari/Yoshitsugu, Masamune/Kojuurou, Yukimura (played by Yoshioka Yuu)/Sasuke, Keiji/Toshiie/Matsu, Motochika/Motonari and Tenkai/Hideaki. The pictures are accompanied by an A4 pamphlet (¥2,100) and a selection of four clear files available in Ieyasu/Mitsunari, Masamune/Yukimura, Keiji/Kojuurou/Sasuke and Motochika/Motonari designs (¥600 each). Yoshioka Yuu will be the actor dressed as Yukimura for the clear file. Regular updates have started on the stage play's official blog, so it feels as though the performances are getting closer every day. It's been well-reported already that Itou Ryuu's ongoing Sengoku Basara 3 -Bloody Angel- manga has ended ended its serialisation this month. I guess that means that the eighth volume will be the last one. Since Itou has penned a few official Sengoku Basara 3 manga adaptations already I wonder if there'll be another new title in the 'Blood' series later on? 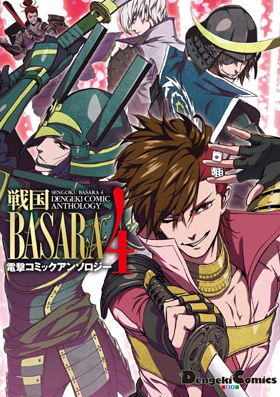 In happier news, we also finally have a sample of the cover artwork for the new Sengoku Basara 4 Dengeki Comic Anthology manga, now due for release on 8th May 2014 priced at ¥850. They promised that it would feature the new characters and it looks as though they meant it! I hope that the cover wraps around to show the rest of the newcomers on the back (and I also hope we'll get to see the full list of artists soon). Last but not least, I'd recommend that manga fans keep an eye on Sengoku Basara 4 artist Yoshihara Motoki's twitter feed. There have been a lot of wonderful rough layouts and inked artwork posted recently! I put SB4 Comic Anthology in my purchase list and looking forward to the list of artists myself (more sanorin for me if possible, lol) and that set of badges may end there as well (most characters I like being represented in it) depending on what else there will be to purchase at the time of its release . I might consider SB Complete Box since there's no region lock on blu-rays (NA combo-pack release I own is locked so it mostly a DVD release for me anyway) but the lack of subs pretty much kills the idea for me as I don't speak (and barely understand) japanese. I have to resist the badges, I have so many and nowhere to put them (they're so collectable ;_;).